I want to share a life story with you that cannot just leave your heart untouched. It is a story of life and faith of a simple girl from Ukraine. Her name is Diana Petrenko. The story begins September 17, 1996 in Vynogradiv , Zakarpattya. Born was a little girl who once without words will change life of people. God has sent one more life, one more miracle. The girl was growing up, and in Ukraine at the time when the Soviet Union had just collapsed. After the collapse, people were fighting for survival. Diana’s dad began to drink and left the family when Diana was 10 years of age. Her mother was left alone with three young children. The Soviet Union educated people to be atheists; they have always been taught that God does not exist. The girl’s mom did not know God and Jesus Christ as her personal savior. She worked hard to feed their children. Sometimes for days, and sometimes nights, worked at the factory as seamstress. But this wasn’t enough to live. Then, for whatever reason Diana’s mom lost her job. Whether the reduction or weakened eyesight from the constant sewing. Maybe she just broke down of the hard life without God. The family had nothing to live on. But God led Diana and her younger sister Anya with the Christian mission of "Light of Love" and "LifeNets." The girls were invited to the camp for street children sponsored by Christians from the United States through Victor and Beverly Kubik. Organizers of the camp, pastor Vasily Polichko and his wife Irina took the girls under their wing, told them about Jesus and how he loves children. Diana became a Christian at 11 years of age. Childlike faith has always remained in her heart. Daily Diana and her sister could come for lunch to the mission. Before each meal there was a Bible lesson, songs in praise of God and prayer. Mission also helped the girls with clothes and food. God does not forget orphans! Since then seven years had passed. The girl has grown up becoming a Ukrainian beauty. Faith has also increased. Now God is the most important thing in her life. Although life is not easy sometimes, you will never hear any complaints from her. 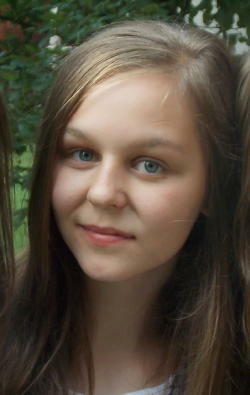 She is now studying in 11th grade, last year of school. Also, Diana has a talent for singing and playing the cello. She attends pastor Polichko’s church every Saturday. Together with her sister, they have little cleaning jobs. They earn $70 a month for two to support the family. Diana perhaps from 13-14 years of age is supporting the family. Someone else would by now already complain on life and on God, but you won’t hear it from her. She is an example for the children of Ukraine and even America. Because sometimes even when we have family, good parents, we still do not appreciate it. For the last eight years every summer girls are attend camp at the mission "Light of Love." It is a great blessing for them. Each volunteer from the USA remembers the sweet girl Diana, sometimes with sad eyes, but always welcoming and sincere. When she sings, I want to say; Thank God for her heart. Oleh Kubik loved Diana from first camp and became her uncle Oleh, who is always refreshing her faith in God's love. He is one of those people who was impressed by the faith of this girl and her warmth, despite the difficult life. This year LifeNets sent Eugene Kubik to Ukraine. This is a man who knows what it means to grow up without a father and lose a mother early. And God granted him in his heart a desire to be a father at a distance for orphans, for Diana and her sister. Diana is thankful to God for everything: for the Light of Love Mission, for Lifenets, for Oleh and Eugene Kubik. Thank you for supporting children in Ukraine! Now their family is having problems with housing and neighbors who unfortunately are alcoholics and have bad attitude towards the girls. Please pray with us that God will somehow help solve this problem. Also pray for Diana’s mother who's lived a difficult life so she accepts Jesus into her wounded heart. We give special thanks again to the Scharpen Foundation http://scharpenfoundation.org/ in Wildomar, California and the Rock Valley Christian Church for their years of support that has changed so many of these children's lives.